Admitted to practice since 1977, I have spent decades working in the system to help my clients reach a better future. I personally investigate each person's situation to determine the best course of action to reach the most optimal outcome. Through collaborating with my clients at my law office, I am able to steer people through some of the most difficult moments of their lives. I take a compassionate approach to their circumstances, always ready to lend an ear. The landscape of bankruptcy law is vast and requires an attorney who is devoted to staying on top of emerging trends. I am a member of the American Bankruptcy Institute, the Winnebago County Bar Association, the Illinois State Bar Association and the National Association of Bankruptcy Trustees. Through these groups, I have access to tools and professionals useful for resolving my clients' issues. The law office of Bernard J. Natale, Ltd., offers free initial consultations. Bernard J. Natale, Ltd., is a debt relief agency. 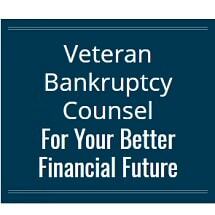 I help people seek bankruptcy protection under the U.S. Bankruptcy Code.